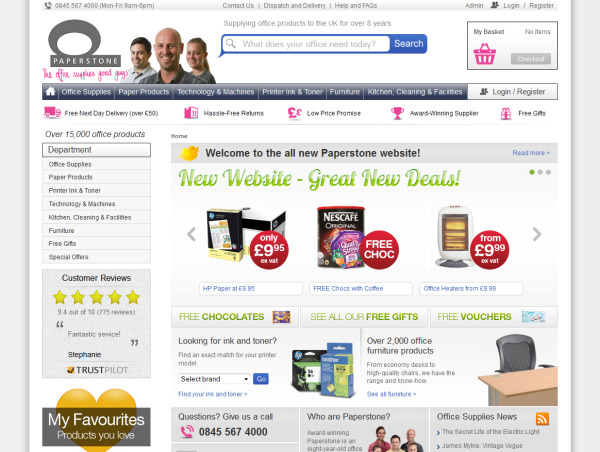 Our long-standing customers will have grown accustomed to the old Paperstone website with its predominantly dark grey background and bright green messaging. In order to keep up with the times we've given the wole site a visual refresh, centring the pages, brightening the palette and updating images, including new pics of the team! We've vastly improved our site search, with type-ahead / predictive text, spell correction, and more relevant results. A new drop-down menu replaces the old static menu. Just hover over the tabs to reveal more detailed lists to help you navigate. 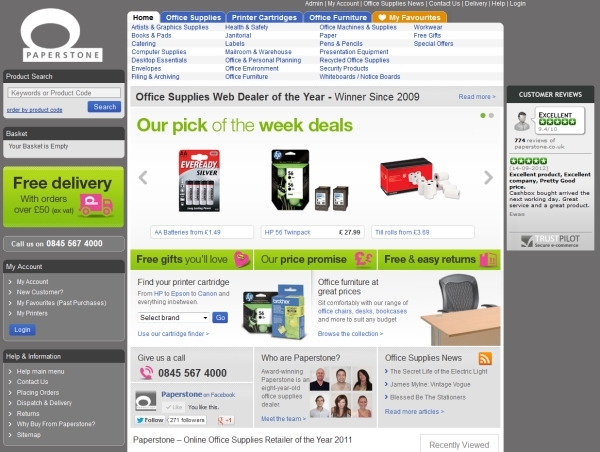 To easily sort through long lists of products, we've added brand, colour and price filters on the left. So if you've got a long list of lever arch files and you're only interested in blue ones, click on the 'Blue' filter. You'll only be left with blue lever arch files to choose from. It goes without saying that we're essentially the same Paperstone with the same great prices and same focus on going the extra mile for our customers. There's been no management buy-out. Nor have we contracted out our customer services to some far-flung call centre. We've tried to ruffle as few feathers as possible with this redesign but we realise that the change will take some getting used to for our existing customers. So please don't hesitate to pick up the phoe and call us on 0345 567 4000 if you have any questions, need any help ordering or want to give us some feedback on the new site. You can also leave feedback by clicking the image on the left.